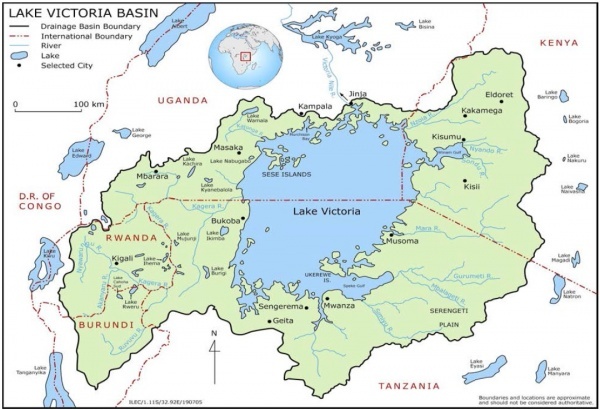 Lake Victoria Basin has a population of 40 million, with a population density of 250 people per square kilometre. Lake Victoria is bordered by Uganda, Tanzania and Kenya. It is the main source of food and livelihoods for riparian communities. The predator Nile perch, which was transplanted in the lake in 1950 by the British colonial administration, decimated the population of smaller fish, which were traditionally a source of food and livelihoods for lakeside communities. The Nile perch fishery produces one million metric tons of fish for export per year, but economic benefits flow almost exclusively to foreign companies. Due to high demand for Nile perch in the international market, prices have soared beyond the common man's reach. Expansion of capital intensive, industrial level operations in Nile perch harvesting, processing and marketing has resulted in massive transfers of protein supplies away from food deficit areas to serve the lucrative export markets. The involvement of large firms in capture operations has marginalized artisanal fisher folk, forcing them to engage in subsistence agriculture, burning charcoal for sale and selling wood fuel. With the disappearance of significant native fish numbers that feed on algae and detritus, the organic material is left to decay and sink to the lake floor, where its decomposition absorbs the oxygen available for fish living in deeper layers of the lake. In spite of extensive research on Lake Victoria, no action has been taken to restore the native fishery in order to sustain the livelihoods of 40 million people that depend directly or indirectly on the lake. To a large extent research work is externally conceived and financed, and is silent about the plight of riparian communities and the dying lake that serves as their life support system. Towards this end, EPIC, together with its partners, is developing responses that seek to raise awareness on biodiversity and the humanitarian crisis in the Lake Victoria region. These responses aim to promote recovery of threatened endemic fish species and to support local communities in rebuilding their fishing villages by applying both traditional knowledge and modern science. They are also designed to enable farmers in the surrounding watershed to adopt the Vetiver Grass Hedgerows System to control nutrient-loaded runoff, and also to develop skills in innovative entrepreneurship. Activities are expected to contribute to restoration of biological diversity and ecosystem function as well as recovery of the native fishery, hence enhancing the livelihoods of lakeside communities. The project will also expand livelihood options to reduce pressure on the fish stock. The Lake Victoria Basin (LVB) has a population of 40 million with a population density of 250 people per square kilometre. The lake is shared by Uganda, Tanzania and Kenya, and prior to the 1980s, was the main source of food and livelihoods for riparian communities. According to a lake-wide trawl survey at the end of the 1960s, haplochromine species (cichlids) endemic to Lake Victoria comprised 80 percent of the demersal fish biomass of Lake Victoria (Kudhongania & Cordone 1974, cited in Njiru et al. 2005). Following the introduction and establishment of the predator Nile perch (Lates niloticus), the contribution of haplochromine cichlids to fish biomass decreased rapidly, from 83 percent during the 1970s to less than one percent by the mid-1980s (Njiru et al. 2005). The ecology of the lake has been turned upside down causing a total collapse of the native fishery. Introducing Nile perch and tilapia to Lake Victoria traded the lake’s biodiversity and an important a source of local food for a significant, although unsustainable, source of export earnings. Prior to the introduction of Nile perch, people enjoyed a diversity of fish species, and the native fishery was dominated by the cichlids, which contributed significantly to household incomes and served as a source of affordable protein for a large section of the wider society. 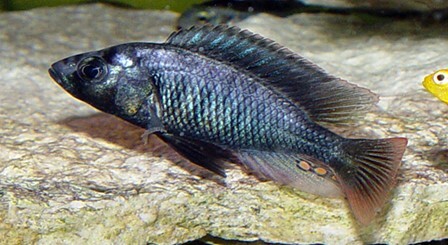 Pringle (2005) asserts that haplochromine cichlids were widely utilized by local fishermen, but the British disdained them, labelling them “trash fish”. In those old good times, of the 1930s, when the fisheries were predominantly native, a kilogram of fish cost UGX 10 (Ugandan Shillings) and demand arose from the local markets. Economic activities in the fisheries were structured around the family unit, which facilitated the distribution of economic benefits at the nucleus of society. The roles of men and their sons included boat construction, repairing broken fishing nets and capture of fish, whereas women and their daughters processed and sold fish in the local markets. Women also sold mukene (Rastrineobola argentea), a tiny fish used as a sauce, to the poor who could not afford to buy bigger fish. Likewise, women prepared food and sold it in local markets. Trust and a sense of ownership were the drivers of a flourishing sustainable native fishery that secured benefits for biological diversity and human well-being. Partners in ownership were more decentralized, and income from fish catches was fairly and evenly distributed (Kayiso 2009). Household income was high and therefore people faced fewer hardships in paying family expenses, e.g. paying school fees for their children or buying basic necessities. Steady income was a factor in stabilizing marriages according to local beliefs. Around 1900 large scale sugar works and tea estates were established in the surrounding watershed to take advantage of fertile soils and frequent rains. They attracted immigrant workers seeking employment who settled in the lake basin, hence increasing population and demand for lake resources. The influx of immigrants had social, economic, ecological and cultural impacts on the fishing villages. For instance, the locals learnt new fishing methods from immigrants such as pokoto from Lake Kyoga. Jaluo women from Kenya brought knowledge of medicinal properties found in the enkeje (cichlids) fish species. Population explosion increased the demand for fish and resulted in hikes in fish prices. However, at the same time, it was possible for artisanal fisher folk to retain profitability in fisheries based on their effort to work in a cost effective manner within the ecological limits of the fish stock in the lake. Native fisheries harvests used small manually propelled rafts and simple dugout canoes and other affordable local materials such as papyrus seine nets, basket traps, harpoons and hooks. These crafts could not go long distances from shore, and therefore had little or no impact on fish stocks. Traditional fish capture methods provided employment opportunities for young men. The supply deficit was a blessing in disguise because it created room for participation by more local fishermen in the capture of fish to supply the growing fish market. It also offered opportunities for innovation to cope with increasing demand. At that time, small scale operators dominated the fish processing and trading subsectors, according to Abila (2000, cited in Njuri et al. 2005). These were mainly women; they sold fresh fish and processed the surplus using simple technologies such as smoking, salting and sun drying for later sale. The traditional fish harvesting methods were therefore economically viable, environmentally sound and socially acceptable in that they supported the livelihoods of the locals in terms of employment creation and generating income for households. Both men and women were fully employed in the capture, processing and marketing of fish. The elders we talked to claim that their livelihoods were far better than they are today following liberalization of Lake Victoria fishery. Notwithstanding the above social trends and economic performance, around 1900 the British colonial administration established a large fisheries industry in Lake Victoria, purportedly to meet the high demand for fish by the growing population and to take advantage of the arrival of the new railway line from the East African coast. The move was also designed to allow entry of the colonialists in the fish trade, to secure their dominance and control of resource use to the detriment of the livelihoods of riparian communities. Poverty was one of the tools used by colonialists to subdue their subjects. It can be inferred, therefore, that the plight of livelihoods in the Lake Victoria SEPLS was deliberate and a result of hostile policies of colonial rule. The colonialists introduced nylon gillnets and outboard engines which allowed large numbers of fish, particularly the cichlids, to be caught, leading to a sharp decline in the native fishery. Hence, the livelihoods of lakeside communities started to deteriorate. In 1950, the British colonialists illegally introduced the predator Nile perch (Lates niloticus) and tilapia to Lake Victoria, amidst protests from scientists and the media. Moreover, Pringle (2005) shows that, in 1950, the East African High Commission implemented the Lake Victoria Fisheries Act. The act initiated several conservation measures, one of which was the stricture that “any person, who introduces, puts or places into Lake Victoria any fish, or the spawn thereof, of a species other than that in Lake Victoria…shall be guilty of an offense against this Act.” This Act was disregarded by colonialists and their agents, the first transplants were branded and locals were asked to throw them back in the lake when found in their nets. The introduction of Nile perch in Lake Victoria was first proposed by Graham (1929), to feed on what was termed “trash fish” and convert the population of fish in the lake into larger fish of greater commercial and recreational value, reports Anderson (1961, cited in Taabu 2004). The eventual move to introduce the alien species did not give due consideration to the locals who depended on the fish in the lake for their livelihoods and as a source of protein and medicine. The decision deprived the natives of their livelihoods and concentrated economic benefits derived from the newly established fishery among a few foreign companies. The colonialists being exploiters and plunderers of natural resources had projected the inability of the poor artisanal fisher folk to access the capital required for investment in Nile perch fishery due to lack of collateral, which gave the foreign companies the exclusive monopoly in the Nile perch fishery today. This deliberate attack on riparian communities and their resources, has resulted in acute poverty and misery up to the present day, is tantamount to a crime against humanity and contradicts the United Nations Sustainable Development Goals: 1) End poverty in all its forms everywhere, and 2) End hunger, achieve food security and improved nutrition and promote sustainable agriculture. The following section will examine the threats and challenges emanating from the loss of native fish species diversity and how these threats and challenges have affected the livelihoods of riparian communities in the Lake Victoria Basin. Examination is based on our many years of engagements with different stakeholders in the Lake Victoria SEPLS, existing reviews and first-hand information gathered from both men and women that participated in the native fishery prior to the introduction of Nile perch. Today poverty and degradation are inextricably linked around the lake where they both occur on a vast scale. The Nile perch boom starting from the 1980s had far-reaching social, economic and ecological repercussions on the livelihoods of lakeside communities, but this paper will discuss only the first two. The growth of commercial fisheries, especially Nile perch export, resulted in reductions in fish stocks and availability of fish to local communities in the Lake Victoria region. This decline in fish has not only threatened the livelihoods of artisanal fisher folk and processors but also threatened the nutrition and food security of populations in the region, as suggested by the study of Kabahenda and Hüsken (2009). The export oriented fishery has further led to marginalization of women in the post-harvest sector. This dealt a big blow to the level of nutrition and fish food security within fishing households since women are responsible for producing and preparing food in the African family setup. Indeed, bigger turned out not to be better for the local population, Nile perch are found too far out in the open water for small fishing boats, and are too big to be caught with unsophisticated gear. They are hauled by the ton from the open lake by large commercial boats and sold to nearby foreign-owned processing plants where they are rapidly cleaned, filleted, boxed and frozen. From there, they are sent off to the delicacy freezers of food stores in the Middle East, USA and Europe, leaving lakeside communities starved, physically weak and unable to carry out any meaningful work to earn a living. Only factory rejects and bones are left behind for local markets. The collapse of the cichlids fishery, which was also the engine of the local economy, was caused primarily by the introduction of two exotic species, the Nile perch and tilapia. The Nile perch fed on the cichlids and outcompeted them for food. A voracious predator, the Nile perch has virtually eaten its way through all its potential prey species, destroying the diversity of the lake’s fish species and the related livelihoods of the indigenous people. Furthermore involvement of large firms in capture operations marginalized artisanal fisher folk leading to unemployment and decline in household income. This has forced them to engage in subsistence agriculture on fragile landscapes causing severe soil erosion. They also burn charcoal and sell wood fuel which is directly related to deforestation. The few jobs created by the processing plants, bearing in mind that most of the work is done by machines, do not necessarily benefit the lakeside communities, but rather are taken up by other people from a different section of society. Anonymous sources informed us that labour gangs hired by the companies in the fishery are not necessarily from among those who lost their livelihoods, and that they can be from anywhere inside or outside the country. This leaves the indigenous people as the victims of extreme poverty, sometimes forcing them to immigrate to urban centres in search of hard-to-get jobs. As currently more capital is needed to engage in fishery, those who do work as fishermen are often not the boat or net owners, but the employees. This has led to a situation whereby the owners of the resource have become slaves on their own property, earning far less than what they used to earn when they were fish traders. This situation raises the issue of equity in relation to access to productive resources and distribution of benefits. The growing involvement of wealthier entrepreneurs, politicians and industrial firms in the Nile perch fishery jeopardizes every effort aimed at enhancing the livelihoods of the poor through the revitalization of the native fisheries, simply because the former influence the steering of policy processes and measures to their advantage. Large-scale trawling, processing and export marketing operations have caused shortages in the supply of fish for local markets, thereby undermining the growth of local economies and worsening poverty levels. Fishermen are now away from home for extended periods and their wives and other members of the family are no longer involved in their activities, typical unemployment of the highest order. Due to the relatively high price of fish, managers do not like fish to be taken home by crew members, who happen to be the true owners of the resource. The controversial Nile perch fishery is characterized by deprivation, denial and daylight robbery of the weak by the powerful. The increased value of the nets and the fish has led to the increased incidence of net and fish thefts, according to U.S. Fish and Wildlife Service (2014). Fishermen now do not earn enough to meet all their basic needs because they are underpaid as casual labourers in lieu of making profits in fish trade. “In those good old days we took all our catch back home to our wives, but now we take the fish to the factory leaving our families with nothing at all to eat” explained Mr. Mulongo, the Local Council Chairman (Figure 5). Due to high demand for fish on the international market, prices have soared beyond the common man’s reach. 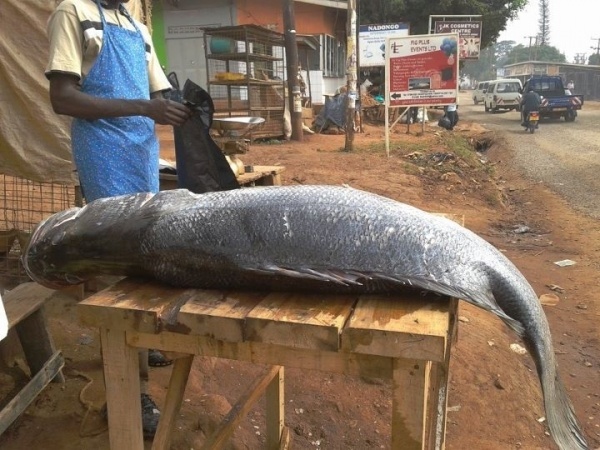 The current cost of one kilogram of fish is UGX 30,000 (USD 10) according to local sources. The effects of the changed fishery, characterized by loss of livelihoods and economic exclusion, are unacceptable with respect to the societal norms of riparian communities, and constitute a serious environmental problem with an international dimension. The locals have forfeited their lake-dependant livelihoods in the name of liberalization, but at the same time they cannot afford the price of fish in the market. Parents can no longer afford to put their children through school and the numbers of street kids have increased, as have the levels of social crimes. Women in the lakeside communities prostitute themselves to survive, one lady respondent at Ripon landing site claimed. This is backed up by the fact that reports of the first victims of HIV/AIDS, a deadly sexually transmitted disease, came from Kyotera in Masaka on the shores of Lake Victoria in the late 1980s. Women in the Masese fish market have switched to tomatoes (Figure 6), explained Deborah Kwebiha of the Masese landing site market. Meanwhile others work as house maids. 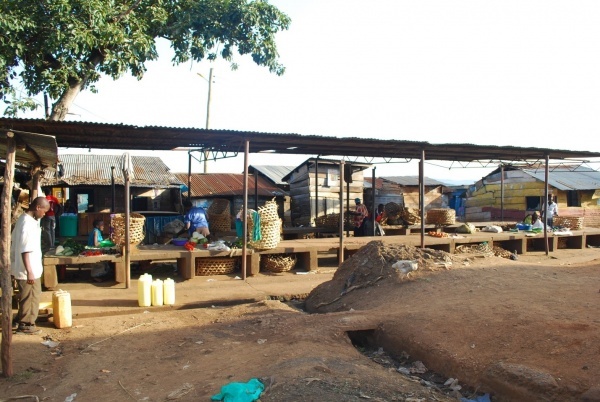 Likewise, mukene trade is also declining due to changes in the mixture of chick feed where soya is now the main ingredient, according to local sources in the Kikondo fishing village. Locals have also complained that climate change has reduced the productivity of wetland rice schemes, leading to loss of jobs. When the colonial administration introduced the Nile perch, they altered the balance of goods and services the lake produced and redistributed the economic benefits flowing from them. Lake Victoria supports the largest freshwater fishery in the world, producing one million tons of fish per year; however, riparian nations are among the poorest in the world, reports the African Great Lakes Conference (2016). In spite of the general economic boom, the changed Lake Victoria fishery has concentrated income among a smaller proportion of participants in the fishery, leaving the majority poor. Local people have progressively been edged out of this production by the pricing, marketing and processing advantages of the factories, as reported by Abila (2000, cited in Njuri et al. 2005). The liberalization of fish trade around the Lake Victoria Basin has resulted in negative social and economic trends in form of food insecurity, loss of jobs and livelihoods and reduced household income. Kabahenda and Hüsken (2009) indicate that although it is often argued that an increase in returns from the sale of value-added products improves national income and food security, evidence from the Nile perch boom shows that commercialization of fish products does not have direct benefits for local communities that depend on these products for food. For example, the report on high levels of malnutrition among children in the Suba district (Abila 2006a, cited in Kabahenda & Hüsken 2009) which is a major fish exporting district on the Kenyan side of Lake Victoria, is not an isolated case of malnutrition resulting from insufficient regulation of exportation of fishery resources. This is well echoed in “Big Fish, Small Fry”, a documentary on the effects of globalization of Lake Victoria fisheries on food security, employment, and incomes of local communities (Jansen & Boye 2001, cited in Kabahenda and Husken). One respondent to EPIC’s survey from Kikondo fishing village reported that some families can hardly afford to eat one meal in a day. He appealed to donors and the government to provide food aid to the starving lakeside communities. The affected communities believe that other livelihood options need to be explored. They call upon the government to regulate the Nile perch industry in order to allow more participation of local fishermen in the capture and sale of fish in local markets. Others want to see the Nile perch eradicated from the lake in totality to enable restoration of the native fishery and enhancement of their livelihoods. The majority of respondents agree that, as the ecology of the lake is being restored, it is time to switch to other income generating activities, such as poultry or bee farming, goat rearing and handicrafts, but they lack skills and capital. In terms of existing interventions by different stakeholders seeking to address the many threats facing the Lake Victoria SEPLS, a number of actions can be highlighted. The Lake Victoria Environmental Management Project, Phase 1 (LVEMP-1), covering Kenya, Uganda and Tanzania and funded partly by the World Bank, was a multi-stakeholder initiative in which the three riparian states participated and contributed funds. It supported many knowledge-building activities that advanced understanding of the lake’s ecosystem, particularly in the areas of biodiversity of fish (establishing a baseline), levels and sources of pollution, fish stocks, and hydrology. Significant work by the fish quality laboratory resulted in the lifting of the temporary ban by the European Union (EU). Needless to say, the project did not address the direct cause of the decline of native fishery and livelihoods, namely the predator Nile perch. It failed to make, as its starting point, comparison between the merits of native fishery and those of the exotic Nile perch for local economies and ecosystem function, thereby missing the significance of traditional management systems and sound biological diversity that preserved the lake for centuries, while at the same time generating benefits for human well-being. Instead the project promoted and supported development and expansion of the Nile perch fishery at the expense of biological diversity and livelihoods of locals. The Lake Victoria Environmental Management Project, Phase 2 (LVEMP-2) is a regional project implemented by five East African partner states: Uganda, Kenya, Rwanda, Tanzania and Burundi. Its objectives are achieved through four broad project components: (a) strengthening institutional capacity for managing shared water and fishery resources, (b) point source pollution control and prevention, (c) watershed management, and (d) project coordination and management. It is however imperative to state that under component (c) watershed management, eight kilometres of terraces have been excavated and bunds maintained as an on-farm measure for soil and moisture conservation on the Uganda side. However, the terraces get filled with silt while the bunds get washed away by runoff. Hence, the Environmental Protection Information Centre (EPIC) is proposing the Vetiver Grass Hedgerows System, a vegetative technology that creates permanent terraces. LVEMP-2 also does not address the direct causes of decline of livelihoods, emanating from introduction of Nile perch in the lake. The Lake Victoria Fisheries Research Project (LVFRP) was established in 1997, by the three East African states of Uganda, Kenya and Tanzania, with financial support from European Union. Its principal objective was assisting the Lake Victoria Fisheries Organization in the development of a framework for the rational management of the lake’s ﬁsheries. This research project too arrived at a time when the Nile perch had already damaged the lake’s native fish stock and established itself. The project did not perceive the introduced exotic Nile perch as a pertinent issue deserving thorough study to ascertain its socioeconomic impact on riparian communities. One of the areas LVFRP has addressed was an attempt to involve ﬁshing communities in managing the lake’s ﬁsheries through Beach Management Units (BMUs). However, BMUs are regarded as ineffective by the fisher folk because they do not guarantee the flow and fair sharing of benefits from the new fishery. They also complain that BMUs are created politically and as such do not represent the interests of impoverished lakeside communities, reports EPIC (2016, pp. 35&39). Furthermore, this research project did not contribute to solving contemporary environmental problems associated with the biological diversity crisis and the controversial Nile perch fishery, which are central to the cause of decline of livelihoods of riparian communities. On the contrary, emphasis was put on stabilizing Nile perch in the lake at the expense of the native fish stock that is supportive of local economy and livelihoods. The Environmental Protection Information Center (EPIC) is a non-governmental and not-for-profit organization which was conceived and registered in Uganda in 1998 to address environmental issues in the region. EPIC aims at informing minds, reforming lives and protecting biodiversity for human well-being. Our work has resulted in the improved quality of life in several marginalized and poor communities through protection, conservation and sustainable use of natural resources. Our multidisciplinary orientation provides a strong platform for discussing rural policy issues and increasing awareness on why investment in natural resources management and rural development is critical in reducing poverty, improving food security and enhancing biodiversity conservation. EPIC organized a workshop on Socio-Ecological Production Landscapes and Seascapes (SEPLS) from 7-10 August 2017, in Jinja, Uganda with financial support from the Satoyama Development Mechanism (SDM). The workshop took participants to the three fishing villages of Masese, Wanyange and Ripon landing sites on Lake Victoria, to test the three-fold approach of the Satoyama Initiative, and to assess the situation of the livelihoods of lakeside communities. Community members were given a chance to express their concerns. Ones of their complaints was that they are not consulted by government on lake management related issues. The workshop created a shared understanding on issues related to the lake resource management, loss of biodiversity and decline of livelihoods, among other things. EPIC is working with local authorities in Kikondo, Tongolo, Wanyage, Masese and Ripon, to support 10,077 smallholder farmers from the above fishing villages in the adoption of the Vetiver Grass Hedgerow System for soil and moisture conservation, in order to increase soil nutrient retention levels in their crop fields, and improve yields. The hedgerows will also prevent nutrient-loaded runoff from washing down into the lake causing eutrophication (Figure 7). Local authorities in the Kikondo fishing village have requested EPIC to setup a vetiver grass nursery for the community to serve as a source of planting material. They have offered two hectares of land for this purpose. After consultations with the National Environment Management Authority (NEMA) and the Ministry of Agriculture, Animal Industry and Fisheries (MAAIF) of Uganda on promoting the recovery of threatened endemic fish species of high economic and ecological value (particularly those that are preyed on by the predator Nile perch in Lake Victoria), the MAAIF has most recently approved EPIC’s proposed intervention that seeks to utilize sand pits in Katonga swamp in the Lake Victoria Basin for conserving and breeding diverse native fish species. Targeted species include Alestes (Nsoga), Bagrus (Semutundu), Barbus (Nkisanja), Haplochromis (Kenjje), Labeo (Ningu), Mormyrus (Kasulabane), Synodontis (Nkolongo), and Tilapia (Ngege), among others. EPIC intends to bring on board various stakeholders to create linkages particularly between private investors in Lake Victoria fisheries and upland famers in the surrounding watershed with a view towards initiating incentive schemes such as Payment for Ecosystem Services (PES) to motivate farmers engaged in sustainable conservation livelihood activities to address socioeconomic and ecological challenges, as a win-win for the two sides and ecological restoration. A number of activities are being proposed by EPIC in full recognition of the interdependence of the socio-ecological and economic factors responsible for the plight of local communities and their livelihoods. Enhancing the livelihoods of affected communities must therefore go alongside restoration of the biodiversity and ecological stability of the lake to enable a sustainable, sound native fishery to flourish on the lake again. This can be achieved through ensuring integration of both social and ecological aspects in the management of Lake Victoria fisheries. The intervention proposed by EPIC has five (5) key activities, summarized below. National, regional and local training workshops will be organized by EPIC to raise public awareness on the biological diversity crisis in the Lake Victoria Basin (LVB) and the resulting plight of livelihoods of riparian communities, among others. At the local level skills will be imparted in innovative entrepreneurship to reduce pressure on fish stocks. Establishment of in-situ conservation sites is planned. Threatened and depleted fish species of high economic and ecological value will be bred and conserved near to their natural habitats. Large-scale vetiver grass nurseries will be setup by the project, one in each country for Uganda, Kenya and Tanzania. These will serve as sources of planting material for upland farmers and the entire community in the SEPLS. The application of Vetiver Grass Hedgerows Technology by farmers in the surrounding watershed will control eutrophication in the lake and stop the growth of the water hyacinth weed caused by excess soil nutrients. These efforts will contribute to the achievement of Aichi Biodiversity Target 7 (By 2020, areas under agriculture, aquaculture and forestry are managed sustainably, ensuring conservation of biodiversity) and 8 (By 2020, pollution, including from excess nutrients, has been brought to levels that are not detrimental to ecosystem function and biodiversity). Research will be carried out by EPIC and its partners on the predator Nile perch that threatens other fish species and habitats in Lake Victoria, with a view towards eradicating the alien species in accordance with Article 8(h) of the Convention on Biological Diversity (CBD). A website for the project will be setup to enable information dissemination and sharing. Although much research work has been devoted to the fisheries of Lake Victoria in general, and more recently to the Nile perch question in particular, emphasis has largely been on biological, ecological and technical aspects. Socioeconomic perspectives have been deliberately and greatly neglected, even though they are essential to sound planning and effective management of the fisheries and the SEPLS as a whole. Hardly any of the above highlighted interventions, with the exception of EPIC, recognized the negative impact of Nile perch on loss of biological diversity and livelihoods. Instead, their activities were designed to support the development of the Nile perch industry. This implies that existing interventions are part of the problem in lieu of being part of the solution. The Nile perch fishery tragedy on Lake Victoria represents a gross crime against humanity and a contemporary environmental problem in an international context that has failed to be elevated to the global agenda, due to corporate-financed, misleading, biased research work and conflicts of interests among major stakeholders. Moreover Nile perch exports account for less than three percent of the GDP in each of the riparian states (World Bank 2009, cited in Turyaheebwa 2014). The short term economic gains accruing to riparian states do in no manner justify the environmental costs involved. The deliberate alteration of Lake Victoria fishery by colonialists that has caused misery for 40 million inhabitants is socially unacceptable and unlawful, as viewed from the standpoint of the Convention on Biological Diversity. Article 8(h) of the Convention on Biological Diversity requires parties to prevent the introduction of, control or eradicate those alien species which threaten ecosystems, habitats or species. In addition, the Lake Victoria Fisheries Act of 1950, which restricted the introduction of exotic fish species in the Lake, was in force prior to the transplant of Nile perch in Lake Victoria. Hence, there is great need, basis and opportunity for pursuing legal action to implement Article 8(h) of the CBD and to secure damages for the lakeside communities that lost their livelihoods as a result of the unlawful introduction of Nile perch in Lake Victoria. 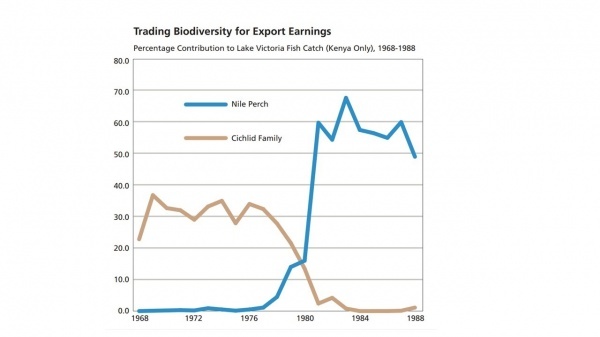 The study found that economic benefits flow almost exclusively to foreign companies that reap profits from Nile perch exports, while riparian communities face the brunt of environmental degradation and the resulting loss of livelihoods. Whereas foreign companies have the flexibility to switch to other ventures, the riparian communities depend heavily on ecosystem goods and services derived from Lake Victoria for their food and livelihoods. It can be inferred therefore that restoration of fish species diversity in Lake Victoria, as opposed to expansion of the Nile perch fishery, is key to solving the current social and economic dilemma in this SEPLS. African Great Lakes Conference 2016, Lake Summaries. Environmental Protection Information Centre 2016, Satoyama Initiative National Network Workshop for Uganda, Workshop Proceedings, pp. 35 & 39. Kabahenda, MK & Hüsken, SMC 2009, A review of low-value fish products marketed in the Lake Victoria region, Regional Programme Fisheries and HIV/AIDS in Africa: Investing in Sustainable Solutions, The World Fish Center, Project Report 1974. Kayiso, F 2009, ‘Globalization of the Nile perch: Assessing the socio-cultural implications of the Lake Victoria fishery in Uganda’, African Journal of Political Science and International Relations, vol. 3, no. 10, pp. 433-442. Njiru M, Waithaka, E, Muchiri, M, Van der Knaap, M & Cowx, IG 2005, ‘Exotic introductions to fishery of the Lake Victoria: What are the management options?’, Lakes & Reservoirs: Research and Management, vol. 10, no. 3, pp. 147-197. Pringle RM 2005, ‘Biology in History: The origins of the Nile perch in Lake Victoria’, BioScience, vol. 55, no. 9, pp. 780-787. Taabu, AM 2004, Assessment of the status of the stock and fishery of Nile perch in Lake Victoria, Uganda, UNU Fisheries Training Programme, Reykjavik, Iceland. Turyaheebwa N 2014, ‘Perception on fishery trends in Lake Victoria’, Norwegian College of Fishery Science, Master thesis in International Fisheries Management. U.S. Fish and Wildlife Service 2014, Nile Perch (Lates niloticus) Ecological Risk Screening Summary.